After spending Holy Week in the far-northwestern Sicilian city of Tràpani immersed in electronics rituals, we headed out on "Pasquette" or Easter Monday, which is a legal holiday. Ours was an inauspicious departure after being surrounded by the pageantry of the week steeped in tradition. 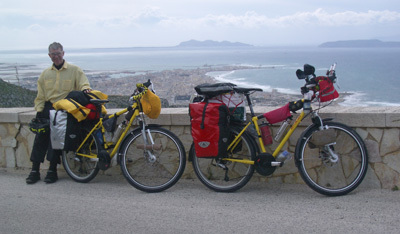 Leaving seaside Tràpani behind with overloaded bikes. Though we'd stayed put for 7 days, we didn't do any packing until the night before departing. Normally we'd have spent hours and hours of a preseason layover refining the assembly of our gear as we merged treasures stored over the winter in Tràpani with those brought from home with the bike parts mailed to us from Germany. We would have thoughtfully studied how we were currently using each precious item and arranged them even more compactly or efficiently. But instead of micro-managing our tangible gear, our time had been gobbled up by projects defined by bits and bites--projects that we'd really rather have completed back home. The forced holiday layover had allowed Bill to solve enough of the new software problems to make the first webpage update for the season available online and I had spent my portion of the laptop time advancing the backlog of 6 new travel files to their next stages. There were dozens if not hundreds of hours of more electronics-related work to be done, but it was time to move on. The hurried packing of our panniers the night before was made even more marginal by the rain on Pasquette morning. We ran for shelter with each brief downpour while loading the bikes, hoping each would be the last. Finally we accepted that the rain was there to stay and we layered on our complete rain outfits. The sloppy packing inside the panniers became worse as we wrenched out the rain gear and was matched with sloppy loading of the gear onto the bikes. It is always hard to tend to the minutiae of loading the bikes in the rain and cold and being the first day of the season meant there were more little items to attach. We urged each other on with "Just-good-enough to get us underway;" that would suffice for the day, we'd do better tomorrow. Bill once again saying "Isn't this great!" It felt like the predicted 35+ mph winds had already whipped up as we said good-bye to Tràpani and we took comfort in it being a short riding day. The distance ridden would be a little over 10 miles but the level of effort would be high. Our bodies that had been off of loaded bikes for 4 months and off any bike for about 6 weeks were going to crank-out 3,000' in elevation gain--an "Alps day." It would take us hours to ride that short distance, especially in the wind and with the extra load of 4 meals to see us through the holiday market closures. Luckily the drenching rains came at the beginning of our ride and again just after arriving at our hotel in the afternoon, leaving us with a mix of sun and light showers in between. The winds persisted, but they were everything but a dead-on head wind, which rapidly saps one's strength and will. As we worked our way up the steep grades to our day's destination, Èrice, Bill kept saying "Isn't this great?" I had to agree despite having leg pain like I'd never had before from the deconditioning. It was grand to be on the bikes again, even in the wind and the occasional rain. There was little traffic and the views were stunning as we zigzagged up the coastal mountain road to the ancient hilltop village. Looking north from hilltop Èrice. I was reminded of the travelers weariness we experienced in Tunisia and again examined why I could have an unusually high level of physical discomfort in my legs and still not have it register as weariness. As I was rounding 1 of the many switch-backs of the day the words that consolidated were "Mind, body, and nature--that's my focus." When riding, especially at the slow speeds of sustained climbing, it becomes a simple world. I noticed the thoughts in my mind, the sensations in my body, and the rocks, trees, weeds, and weather around me. Everything else was secondary. The details of the narrow, lightly traveled road faded into the background, as did the troubles of the world, the business matters of our lives, our health issues, and difficulties at the cultural interface. They all become very remote, amazingly remote. There were no complicated dances on the sidewalks: no sparring for space or second-guessing what was going on around me. Much more pressing was reading the wind in the greenery on the next bend, assessing the photo-worthiness of the panorama, and judging if my legs needed a rest or if it was instead trickery of my mind calling for a time-out. Simple, basic, and uncomplicated is our focus for much of our riding time and it is that simplicity that makes cyclotouring so appealing. 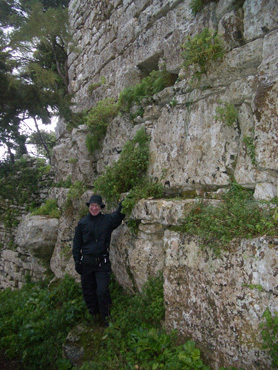 Bill at the 8-6th c bce walls of massive stone. Our experience of nature from the bike is rarely stunning beauty or the exotic. And it is never of the wild wilderness but of highly manipulated land. The land we see has been deforested or reforested; cultivated or abandoned; planted or neglected; was grazed upon or is currently grazed upon. But it is still more alive, more dynamic, more changing and more expansive than the asphalt and concrete of cities. Biking on country roads is a more simplistic reality than being a foot-tourist in the city. I think that is part of why we don't experience the travelers weariness when we are on bikes despite having more physical weariness. We arrived in Èrice in a wet fog that was morphing into a downpour, and yet the ancient village beckoned. My legs ached in a way they'd never ached before but I was desperate to explore the town before darkness settled in. Bill gave my legs a quick massage to keep the overload of lactic acid from incapacitating my muscles. I gobbled down all the high carb snacks in reach and popped a couple of Ibuprofen hoping that the shot-gun approach to my pains would keep me mobile. We bundled up for both the cold and the rain and dashed out for what became a 2 hour immersion in the almost deserted town. .
Èrice is the prefect backdrop for many an ancient story, whether the cast of characters includes knights, damsels, and dragons or archeologists with their drier script. Èrice was founded by the Sicily-based Elymians or Elimi, though all we saw of them were the massive walls they constructed in the 8-6th centuries bce. We walked along the adjacent dirt paths and through the lush undergrowth to experience the dominance of their giant stones under equally gray and overpowering skies. Inside the bastions, we simultaneously experienced their protective effect and the confusion of the in-filling maze of narrow streets. Part of Èrice's intrigue has long been its perfect equilateral triangle shape atop a tiny plateau at about the 2500' level. 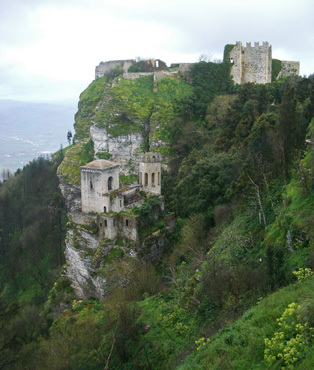 After the Elymians built their hewn stone walls, more well-traveled ancients took control of the pinnacle. The Phoenicians, Greeks, and Romans each took their turn in maintaining sacred temples on the site as well as burning fires at night to serve as beacons for their mariners. The Normans later leveled the temple remains and built a fortress, though the earlier sacred tradition of the site is now advanced by more than 60 churches and monasteries. The old towers below Èrice added to its charm. After exploring the perimeters as best we could from the inside and the outside of them, we reluctantly returned to our room for the night--a room that felt like cast-off dormitory space from one of the religious centers. The views however were stunning from our perch though the clouds left us to largely settle for memories instead of photos of the lands far below us. Èrice had set a high standard of drama and delight for the first day of our touring season. Day 1 to lofty Èrice was hard but a thrill; Day 2 was just plain hard--at least for me. I de-condition more profoundly than Bill and so our second day with another 3000' in elevation gain over the course of 30 miles exhausted me. I was pooped early in the day but there was no intermediate place to stop in these Sicilian hills--we had to keep going. Bill pulled out his first electronic book (Age of Turbulence by Greenspan) to read while he waited for me at the top of each of the many hills. The only way I could keep going was to stop often, which gave him plenty of time to read. My legs would feel better with a rest but it was a brutal process: we were doing sustained grades in the 6-8% range and my inclinometer tickled 13% a number of times during the day. My many stops did however allow me to ponder the range of new sounds the relentless wind made. Before leaving Tràpani we'd looked out the window to make sure our hotel wasn't on fire as the 3 newly hung flags crackled just like popping of burning wood. On Day 2, I noted the varying hums, whirls, and roars of the wind in a single or in a cluster of electrical lines. And a new noise was the rapid fire rippling and then banging of sheet metal. There were the different rhythmic sounds of sheet metal fencing as it pulsed from the remaining single nail in the gusts which were distinct from sheet metal roofing standing on end as only 1 edge was still tacked to the framing. The Sicilian hills were gorgeous but made for challenging riding. Along with the new auditory experiences of the wind tormenting metal, we had a new kinesthetic experience that same day, that of being pelted by fog. It wasn't raining but hill top fog had made Èrice damp and dark in the morning when we left. When we made a right turn out of the village into the wind the fine water droplets must have been flung together as we were hit with surprising force. "Pelted by fog" was the only description of what we'd felt that made sense. These 25-35 mph winds were becoming so ordinary for us on Sicily that we assumed they were ordinary for the island, but we began reconsidering that conclusion. During our first touring night on hilltop Èrice the lights flickered on and off all evening. In the morning when we left, the roads were strewn with small branches and twigs. And down at the bottom of the hill a crew from the electrical company was positioning their bucket lift for a repair. Those observations together with all that sheet metal that was almost but not quite ripped off also suggested that these weren't the usual winds for the area. Calatafimi, one several Sicilian villages we visited with an Arabic name, didn't even qualify for a no-star entry in either of our guide books. It, like many other Sicilian towns in the interior where we stayed, wasn't frequently by tourists. Michelin's Green Guide Sicily has a map of places to stay--a map that almost exclusively recommends staying on the coast in western Sicily and visiting the hinterlands as day trips. Our daily cycling range in those steeps hills was often limited to 25 miles, so Bill had no choice but to eek out lodging in the more remote interior, like at Calatafimi. The enormous Doric-styled Greek temple at Segeste looked surreal. Calatafimi positioned us, well almost positioned us, to visit Segeste. Unfortunately the bus driver the next day chose not to follow the posted route, so we ended up hitchhiking to Segeste, the nearby archeological site. (We were apprehensive about leaving our bikes unattended for hours while at the site.) But despite the transportation hassles to the site and the long walk back to Calatafimi, visiting Segeste made for a stunning day. 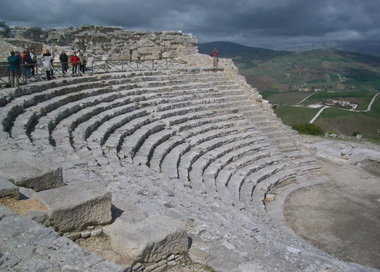 Segeste, like nearby Èrice, was founded by the Elimini and later became a powerhouse in the Greek era. Our Michelin Guide describes the Doric temple (or pseudo-temple to some scholars) as "one of the most perfectly preserved monuments to survive from antiquity" with its bold 36 original columns. The Romans came along and built one of their awesomely situated theaters on the other edge of Segeste in the 3rd century bce, though surprisingly in the Greek and not Roman style of the day. We visited Segeste on the third day of our tour of the interior of western Sicily and it confirmed that we were off to a captivating start. The interior was so much prettier, so much more vital than the western coast line we'd biked in the fall. Indeed it was a lot more effort, but we felt well rewarded and were eager to see more. 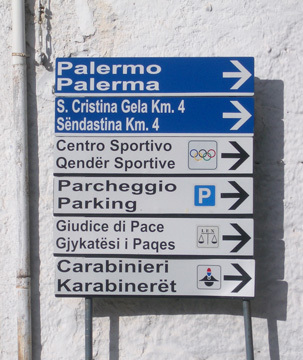 The city of Alcamo the following day however jerked us back to another reality--the grim world of organized crime. I don't know what the current prevalence of the mafia is in Alcamo, but its rough, charmless exterior made it feel like it lacked a heart and a soul. As we approached, I remembered reading that somewhere in its suburbs that it briefly housed the largest heroin refining factory in Europe in the 1980's. Segeste's hilltop Roman-era theatre built in the Greek style. It took an awkward conversation in Italian with our Alcamo hotel clerk to realize that it wasn't just our room in the brand new hotel that had frosted windows--not a single bit of glass in the hotel could be seen out of. The clerk explained that you opened the door or window if you wanted to see out. The blocked view made me think of the stories of Palermo in the 1970's or 80's where there were so many mob-related killings that the citizens cleared the streets at night rather than risk seeing something that might cost them their lives. Perhaps our frosted windows were to keep us safe from knowing too much while in Alcamo. Had the hilltops not been shrouded in clouds shedding rain, we would have known when the sun went down. As it was, the late-day light just kept getting grayer and duller as we hoped to summit the unscheduled peak "any minute now." It was Day 5 of our tour, our 4th riding day of the season and we'd already logged more than 10,000' in elevation gain. If these bonus climbs kept up the next 2 days, we'd be hitting our limit of 15,000' gain per week--a mark we usually only hit when in the Alps and at our height of fitness. The unexpectedly long day had been full of literal and figurative highs and lows. Poor internet access the night before had delayed our departure in the morning as only then could we wrap up some time-sensitive business matters back home. The forecasted 'few showers' had included 2 fierce rain/wind events that had us heading for shelter rather than take the time to pull out our rain gear. My first pick of shelter that day was a disaster. Indeed the door to the abandoned building was ajar, but the short unpaved driveway to it was of tenacious mud. Our wheels weren't spinning at all by the time we pushed up to the shed and the mud formed thick plates on our soles that doubled the width of our shoes. A recently abandoned kitten was thrilled to see us but her incessant meowing and need to climb on us only heightened our distress as we waited out the worst of the storm. When the rain finally slowed, we used sticks to dislodge the mud impacted between our wheels and fenders--just enough to shove the bikes down to the paved road. From there, we coasted a bit hoping some mud would fling off the coated tires. Indeed it did but I hadn't anticipated that it would flip on to my back and pants. It was no longer just our bikes and shoes that were muddy messes as our clothes and gear were slowly becoming spattered and blotched. Cautiously emerging after waiting-out another storm. Huge puddles had formed on the road from the hard rain and we stopped in them to scrape-off more mud and to roll the wheels back and forth for a rinse. We stopped several more times during the day to scrape and slosh the mud and hit the middle of every deep puddle we could find for a little more cleansing in hopes of being presentable by day's end. My next pick for the second cloudburst of the day was far superior to the first. The shorter, almost flat approach to the building had sufficient vegetation to allow us to dodge the mud. It was a lovely shed. The open doorway was oriented perfectly to shelter us from the wind that was predicted to again be in the 35 mph range and it had a little makeshift bench. It was also grand for what it didn't have: garbage, foul odors, or a pathetic kitten. Here we could comfortably eat our lunch and leisurely pull-out our rain gear. My distress level dropped low enough for me locate buried dry socks to replace the ones saturated when rolling my bike in puddles. Bill thought that we'd still make it to our destination by 4 pm, the estimate he'd given our hostess in Piana when he called to reserve our room. But that was when our numerous ups and downs were still fairly mild. Predictably, as the grades got steeper and more sustained, the fatigue level shot-up in my still aching legs. We gambled and lost by taking extra time around 3 pm in hopes of finding lodging in one of the other villages. Had we been able stop early, we'd have happily spent the extra time off the bike doing chores. But instead the time spent searching for non-existent lodging was time we'd later need on the unexpected steeper grades. We pressed on. I again needed frequent breaks and walked my bike for 5 minutes on an easy stretch. I knew it would be too hard to push up the next steep grade, so I took a relative-rest by pushing on the easier grade and then pedaling when it got steeper. That strategy is counterintuitive, but it worked like a charm. All of my coping techniques to keep my composure and to keep the pedals going 'round paid off--I was able to perform, but it slowed us down. Bilingual signs in an unfamiliar language. Fortunately our headlights were only needed to be seen, not to see by, as we rolled under the welcome street lights of Piana degli Albanesi before it was seriously dark. Now worried that the stores would be closing, we stopped at the first little market and barely pulled together items for dinner and the next day's breakfast. The staff were unexpectedly kind and one clerk went out to watch the bikes when Bill came in to shake his deepening chill. The female clerk asked where we were staying and her comment in Italian about "across from the bank" became invaluable later. While at the market, Bill called our hostess to assure her we were still on our way despite being 3 hours late. We descended deeper into the village and Bill's new GPS wasn't up to the task in the dark. He quickly countered its shortcomings by asking a milling-about-Mediterranean-male for help. The man's approach was thoroughly southern European as when he didn't know, he asked someone else. Soon we had a committee of a half dozen locals conferring under the light on the butcher's steps as to the location of the minor street in a language we didn't recognize. We could tell when they'd reached a consensus and one older guy pulled out his rusty English and a big smile to give us directions and closed with several rounds of "Good-Bye, Happy Day." Down another brake-shredding dark hill to another wet intersection (love those disk brakes) and Bill headed out on foot towards a noisy group of teens. The boys quickly shifted from deriding banter to being helpful as he approached in his decidedly un-Italian helmet covered in a shower cap and a reflective vest over his jacket. Again, after more head-scratching, one in the group came up with directions which fortunately were consistent with the other bits we'd been getting like "near the bank". We parked at the beginning of the next big descent, not wanting to make a wrong turn and have to go back uphill. As Bill walked a couple of blocks to locate the B&B, a young teen boy approached me in Italian. I could tell he was asking if I was looking for something, but beyond that, I was clueless. I answered with a butchered version of our establishment's name and he switched to English, saying that was his aunt's place and it was down the hill. Seeing the streets of Piana degli Albanesi in the daylight. I suspected his aunt had called family members in a nearby shop and told them to watch for us. As I walked the bikes downhill one at a time, he came back to confirm that I understood where to go. Bill had found the unsigned place because the hostess was in the doorstep watching for him. Despite being weary from a hard riding day, we were buoyed up by the kind reception we'd received in town. People were unusually outgoing and helpful for southern Italy--help we were so happy to have on this dark, wet night after a long muddy day. 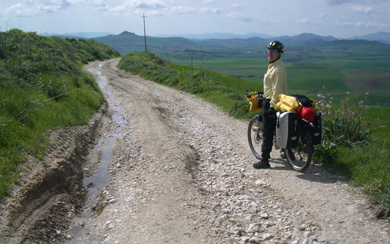 We scrambled to eat, bathe, and wash more mud off of our panniers and clothes as our bedtime slipped by. At lights out, we decided to layover a day, not to press on for what was likely to be another hard riding day. Bill was feeling overly stressed with having to so quickly line-up another route with his new GPS system and we were both pooped. And even though I'd been by far the underperformer for the day, I was actually in better humor than Bill when we got in. My heavily applied coping strategies had worked and I still had some reserve despite my pokiness. We awoke to a 'couldn't be nicer' spring day. Blue skies and the promise of sun on our balcony had us washing mud out of more clothing and gear before heading out for a walk. We collected picnic food at a series of little markets as we headed up the hill we'd screeched down the night before. My legs were suffering from not getting an immediate post-ride walk and it was a case of 'better late than never'. We stopped to eat lunch at the edge of town in a new little sitting area and admired the stunning view of the valley below and the next day's hills beyond. The sight of numerous hiking route signs the day before had left me itching for a mountain walk and we headed further up the hill as a poor substitute. Much to our surprise, we discovered that we were already on a new hiking route up into the mountains. The point we'd selected at which to later turn-around coincidently provided a grand panorama. The WWII bunker defining the point reminded us that the Nazi's had held Sicily but the lovely mountain scene beyond reminded us of the Dolomites. What a treat: to have meandered up the hill past the edge of town, and to then feel like we were deep in the mountains. Bill could feel the last residue of stress from the day before release from his body as we felt the warm air and listened to the wind and distant cow bells. 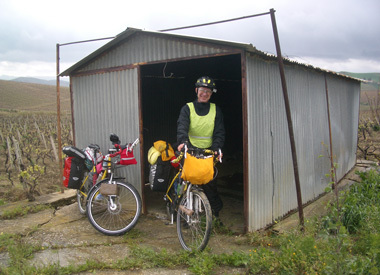 We again revisited the elements of this lifestyle that take one from the physical stresses of riding in hard conditions to the tranquility of a shed that shelters us from the rain or to a pastoral setting like the one that was before us. What a privilege to experience so many realities and sensations in such a short span. Our pleasant outing into the hills above Piana degli Albanesi was topped off by more friendly people back in town. The "Goodbye, Happy Day" man recognized us even without our muddy bikes and gave us a big wave . Another man spotted us while I was waiting for the light to shift for a photo and gave us a little history of the area, in Italian. He indicated we were standing on the grounds of the only Catholic church in town. All of the other churches were Orthodox, which fit with what we'd seen. We'd noticed several gift shops with subtitles like "Greco & Byzantine" which seemed odd. He went on to explain that people had come here from Yugoslavia and Greece and that he spoke Albanese, Sicilian, Italian, and French. And of course, he chatted about other things to which we could only nod and smile. After a handshake, he was on his way. Closer to our B&B another man smiled and asked if we were German. Bill chatted in German a while and learned about his career with Volkswagen building trucks in Germany and his subsequent retirement in Italy. More smiles and handshakes, and we were again saying "Nice people here" and wondering why. Humm....Albanian flag..."Arte Bizantina e Greca"....What's up? It was muddling through the Italian on a plaza war memorial (we read them all) at our next pause and then noticing an Albanian flag that finally had all the pieces colliding. "Albanesia." 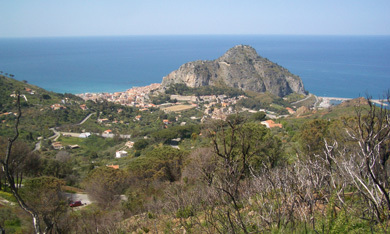 "Piana degli Albanesia." "Greece & Yugoslavia." Our street side guessing was confirmed minutes later by Bill's successful Wikipedia search back in our room. "Piana degli Albanesia" is literally "The plain of the Albanians." This community was settled in the late 1400's by boat loads of Christian Albanians fleeing on vessels hired from Venice to escape an Ottoman invasion. The Albanians had arrived in Palermo and swung a deal with the bishop, which would probably explain the Orthodox church we'd seen there last fall. 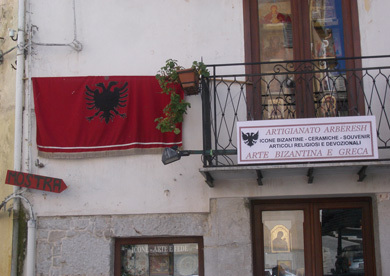 What a hoot: our little excursion into Albania in 2005 had literally put it on the map for us (and their flag in our minds) and we were now learning more about their story in Sicily. We were purring: our layover day taken with a sense of defeat from fatigue had delivered a rewarding walk into the mountains, some friendly exchanges with the locals, and a bizarre little tale of history. This town isn't even in the guide books and yet our visit there was as good as it gets for a day in the lives of tourists. Several days later we would stay in Palazzo Adriano, another of the 5 major Albanian communities established in Sicily as 1/4 of the population left Albania to escape Ottoman rule. Had we not learned of their story in Piana degli Albanesi, we only would have scratched our heads at the sight of a seemingly Catholic church with a decidedly Byzantine priest on the steps but would have left town without a clue. As it was, seeing the modified Byzantine alter panels in 1 of the 2 central churches in Palazzo Adriano had us reading our encyclopedia where we learned more about this eastern branch of the Catholic church. 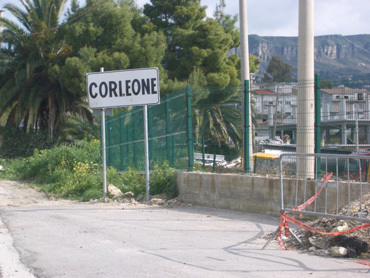 Corleone was our next stop after Piana deglia Albanesi and though only 20-25 miles away, it was in a different world. Our approach to charming Piana deglia Albanesi had been downhill and in the dark and rain but we were greeted and guided by a string of friendly people. Corleone's welcoming party on our uphill route on a pleasant Sunday afternoon was a pack of threatening dogs that were accustomed to having rocks thrown at them given their slight yielding upon seeing us stockpile some projectiles from the ground. Notorious (or "famous" as a young Italian man later commented) Corleone was home and headquarters for Salvatore Riina, The Butcher. Riina changed the Cosa Nostra from an honorable fraternal organization (as viewed by its earlier mafia members) into a killing machine. He wanted total control of the organization and came out of the hills to take over Palermo by killing all of the charismatic, powerful, or ambitious mafia bosses, their subordinates, and their families in the 1980's. No longer was the Sicilian mafia run by consensus of a board, it was Riina's authoritarian operation. Eventually his viciousness backfired as a flood of 'pentito's' or informants turned on him as they had nothing left to lose: he had destroyed their world and the moral structure of their club. "The plaza to the victims of the mafia" was low-budget. I'd read about Riina and the mafia in Midnight in Sicily and our approach to Corleone triggered another tidbit which was 'concrete.' The mafia was (is?) a big consumer of concrete as they diverted their heroin profits into real estate and development. Corleone was described several times as small and backward but in 2008, Corleone had a concrete hi-rise skyline as we approached. 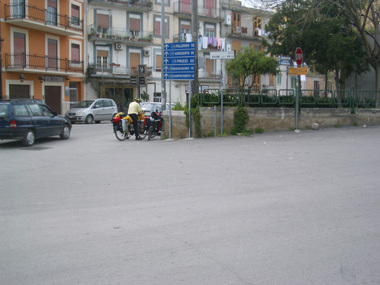 As we rode into town, we went by the "Piazza vittime della mafia" or the plaza dedicated to the victims of the mafia. It was startling for what it wasn't--there was nothing there but a street sign and a bare asphalt intersection. The next day we made a point to track down another memorial prominently noted on our hotel's map of town: the "Piazza Falcone e Borsellino" dedicated to the 2 anti-mafia judges slain in 1992. Again, on a far building was a small piazza name plaque renaming a piazza already filled with religious bronzes. It seemed that Corleone hadn't yet gotten into the full spirit of rejecting the mafia but was only giving it lip service. My shower that night in our Corleone hotel was a fitting analogy for what we imagined to be the affect of the mafia on the cities it dominates. There was a powerful flow of water coming through the pipes but only a trickle reached my body. Despite being a fresh, purpose built hotel, most of the water was diverted through holes in the tubing before it reached the shower head. If Corleone had an infusion of money coming in to support the public spaces as did much of Sicily, it appeared that it was all getting diverted before the public ever saw it. We didn't have a clue as to what extent the mafia control on Corleone had been dismantled. Riina was in prison in Palermo, but mafia bosses have comfortably run their operations from prison for decades. We assumed it was reasonably safe for us to be in Corleone as the Palermo-based tourism information referenced its dark history, but all in the past tense. And even if the mafia was still thriving in Corleone, the conventional wisdom was that the mafia didn't directly affect tourists or ordinary people. They weren't into banditry and petty theft but into higher profit margin undertakings and control. 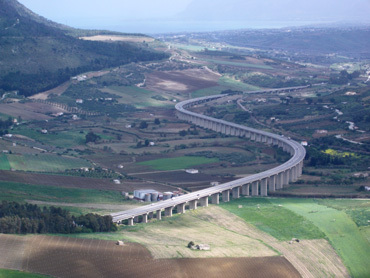 Are these seemingly extravagant bridges mafia projects? 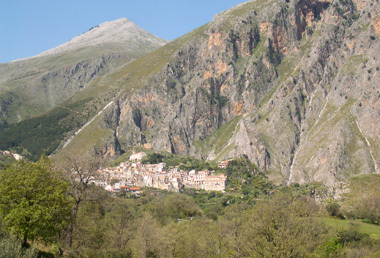 Despite the knowledge that the only little people that the Cosa Nostra bothers are entrepreneurs, we didn't feel at totally at ease in Corleone or the day before on our hike into Piana degli Albanesi's hills. Stories of stringing up shepherds and killing people who saw something they shouldn't kept flitting through our minds. We lingered at the mini-summit of our hike above Piana to admire the scenery and reminisce about pleasant mountain outings but it was the chill of the mafia culture that triggered our decision to return to town when we did. 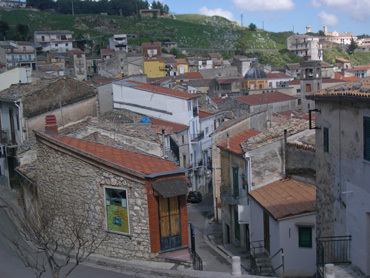 The mafia presence was alluded to, though not directly stated, several miles out of Piana degli Albanesi on the way to Corleone in a memorial from the 1950's to 2 young men who had "disappeared". The inscription continued with "torn barbarically" suggesting both that these guys hadn't been lost in the snow and yet the parents didn't dare be too specific about the tragedy. It was a chance event to have noticed the memorial and yet the shrine to this decades-ago incident reminded us that this land had a long and very dark past. The little memorial was on our minds when we stopped for lunch in the deserted but beautiful countryside between Piana degli Albanesi and Corleone. We compared notes about our levels of unease and sense of vulnerability as we looked for any signs of life in the nearby buildings. We'd only seen 3 or 4 men on the unpaved back roads that day, which was an awkward number. I'd have felt safer seeing no people at all or a lot of people. One or 2 men, never women, every hour or 2 triggers a little anxiety in me. Stories of how "most wanted" mob bosses lived in a series of remote farm buildings for decades kept going through my mind as I slowly understood the ease of being invisible in this backcountry with the help of a few well-placed friends. Both the scenery & the cycling effort were breathtaking. 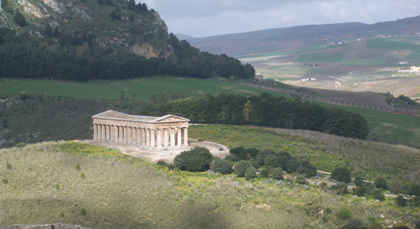 Sicily's dark past was so incongruous with the scenery around us which was incredibly beautiful. 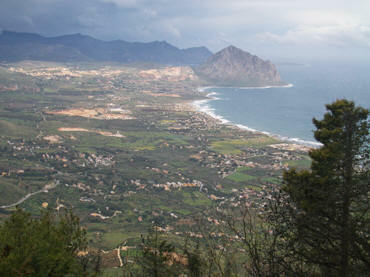 Inland western Sicily ranks with the best for lovely riding that we've experienced. 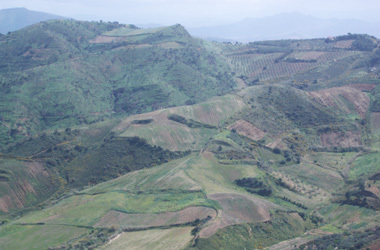 The many converging angles of the steep hills being cultivated with moderately sized strips of different crops made for a constantly changing array of colors and textures. Olive groves with yellow blooming ground covers were flanked by a recently plowed, rich brown fields on one side and a green carpet of tall cereals on the other. Ahead, there might be a purple haze of clover bounded by white craggy rocks or a vineyard just beginning to leaf out. The blue sky with puffy clouds made for a stunning backdrop to this exuberant, bursting with vitality look of the land around us. For all the lovely look of nature though, we had to remember that this was an area with a long and almost continuous history of massacres and revenge killings. Countries like Serbia look like what they are: tired and worn-out. In Serbia, the land looked over-used and abused, the infrastructure was in chaos, and the people were bedraggled--it all fit with what we understood of their current socio-political circumstance. Egypt too had a consistency about it: the physical environment was dry and hostile and the people living in a police state were uptight and reserved. Countries like Germany, Austria, Switzerland and Slovenia also seemed internally consistent--the physical surroundings are pleasing and the people welcoming. But the land of Sicily was lush, lovely and beckoning and yet had this terrible overlay of a culture that had lost its heart, its trust, and its goodwill. As we meandered through the interior hill country of Sicily we noticed that the villages, often of 3,000-5,000 people usually fell into 1 of 2 groups. There were the villages like Piana deglia Albanesi and Castronuovo that were traditional feeling but had a reassuring level of modernizing. Both villages had refurbished or new little public squares, perhaps with benches or greenery. Castronuovo had an area on the edge of town with new picnic tables and a walking path in the works. They both had streets recently upgraded with new pavers and the communities generally projected a sense of pride and contentment. 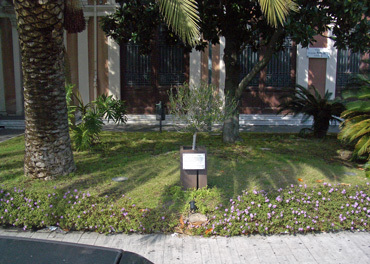 Another dwarfed anti-mafia memorial: a tiny tree & plaque. The other group included cities like Alcamo and Corleone in which the new and the old buildings were uncomfortably juxtaposed and had awkward abandoned spaces in the center of town. The scruffy look of the town on our approach to both made me want to keep on going yet they were both necessary overnight stops. We saw no pleasant public spaces in Alcamo though Corleone had a nice park. Unlike Piana deglia Albanesi and Castronuovo that clearly demonstrated that public works moneys were going into public works, Alcamo and Corleone looked like they suffered from a lack of good planning, strong leadership, or cash. With the billions that Rome has poured into Sicily, we had to wonder if organized crime was more successful in diverting funds in some towns than in others. It was tempting to label the strength of the mafia presence and the difference in the condition of the public places as being 'cause and effect' but we had to be content with un-validated assumptions. "Why?" is always on my mind: I see something, then I want to know why it is the way it is. The Midnight in Sicily book was too scattered for my tastes to tell a tight story of how it all happened--how the mafia came to be and persisted. What I did get from the book is that organized crime in Sicily has its roots in the feudal system. What I don't understand is why it happened in Sicily and not all of the other areas that labored for centuries under the same land ownership system. But in Sicily, the conventional wisdom is that the mafia predecessors inserted themselves between the landowners and the land workers: extorting from both, aiding both. I always thought that the mafia was about money but many believe it is really more about power. The mobsters are people that lust for power and they literally sell a form of it to politicians that also want power. They use power and money to control others. One of those difficult roads that delivered gorgeous scenery. Just over 2 weeks after heading out from the far western Sicilian port of Tràpani in a storm, we descended out of the mountains down to the central northern coast at Cefalù on a gloriously sunny day. The 272 miles we covered in the interior wasn't a great distance for that length of time, but it had taken us through the millennia, through varied cultures, over difficult roads, and through stunning scenery. We'd averaged more elevation gain per day than when riding in the Dolomites of northern Italy yet were rarely over 3000' above sea level. Though many of the names of villages we stayed in the second week told the story as they were either Italian or Arabic for castles, rocks, or vultures. We'd had it all: beautiful sunny days; fierce winds; and we'd stood on the roadside for more than an hour without shelter waiting for a snow, hail, thunder, and lightening storm to pass. We shivered for hours that afternoon and had shivered repeatedly in the hinterlands at the thought of the mafia and its grip on the culture. We'd been warmly received by many people and for the first ever in our travels, kicked off of commercial property where we sheltered from the rain. Several charging dogs had us repositioning our walking sticks on the bikes into makeshift quick-draw 'hostlers' so we could use them as clubs. We felt like voyageurs who'd been out in the wild too long when we arrived in sprawling Cefalù that was swarming with tourists. "Tourists" we thought, though we are 'they', we hadn't seen any international tourists for what seemed like an eternity. .
We entered a different world by descending to seaside Cefalù. Once over the culture shock, we enjoyed gentrified Cefalù. It is indeed a worthy destination for all the visitors it receives as it has a charming old town that has retained most of its dignity despite the crowds. Life goes on in Cefalù's backstreets with many of its old traditions like it does in many other Sicilian towns. For a closer look at life in a Sicilian village with a tourism overlay, return to the Homepage, click on "Photo Gallery" and then "Cefalù Walkabout." 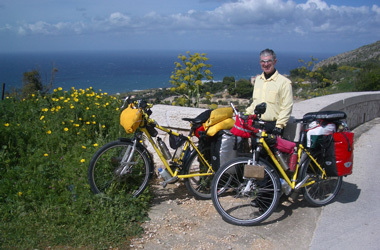 We're a little pokey--we're just getting the start of our tour of Sicily on the webpage as we are leaving the island. We headed out from Palermo on an overnight boat on June 3 to Genoa, and there hopped onto a second overnighter to Barcelona, Spain. Mild motion sickness made those 2 days low-productivity and upon arriving in Barcelona I got nailed with a fierce GI infection. But Barcelona is lovely even if I'm a little green around the gills. The only sightseeing we are doing in Barcelona is ogling the wonderful central city facades on our way to the book stores as this is a route planning stopover. We are making a beeline for the Pyrenees and Bill is scrambling to find hiking information for the area. The wonderful cell phone internet access Bill set-up for us in Italy isn't affordable in Spain, which axed his new route planning tool. The Catalonian Spanish spoke in this region, rather than the more Italian-like Castellan, is adding to our challenges. We are practically mute as we retool our language skills after about a 3 month immersion in Italian. So, it is once again a topsy-turvy transition into a different culture but it helps that we've been in Barcelona several times, the last visit being in 2005.